How far along are you? 22 Weeks – 27 more days until I’m under 100 days! Stretch marks? Nope…following Gram’s advice and buttering up! Best moment this week? Non baby related – getting the kitchen demoed the rest of the way – now to put it back together! Food Cravings? Still fruit juices…not much on food cravings, it’s weird! Weekly Wisdom? I’ve seen this on a few other blogs as part of their weekly survey and since I’ve removed a few others I thought I’d add one back. I’m never sure what they’re looking for here….i get advice all the time so there’s no lack of options here. However, I’m going with my wisdom to others intead. This week’s topic goes with yesterday’s blog – insurance! Pay close attention to your bills and the fine print….I almost paid $700 worth of things I wouldn’t have needed to had I not paid attention! I don’t think there’s a difference between last week and this week but I’m sure there will be soon enough! Now don’t get me wrong, I appreciate having insurance and understand that not everyone does but O. M. G. can’t they get anything right? Word to the wise, always (ALWAYS) double check your invoices and insurance statements. I don’t think I’ve had one come back correct yet – lab work is the worst. I just lost an hour of my life calling LabCorp and then Anthem and then calling LabCorp and then finally back to Anthem to straighten out nearly $1200 worth of bills that they (Anthem) continues to deny for one reason or another (none of which are valid after talking to them). Had I not looked closely I would have just sucked it up and paid figuring my insurance was legitimately not covering it but in tiny print it tells me that they denied it because I needed to bill my primary coverage first – what?! They are my primary! Anywho…a hour, a few grey hairs, and about a year off my life I think it’s straight. All is in Anthem’s hands to pay and we’ll see if that happens in 14 – 30 days! Okay, I promise this is the last one today! I finally had time to sit down and upload everything to YouTube! I mentioned way back when we first announced we were pregnant, we used a video to tell DH’s parents (because they were asking for more Europe pictures etc…) well, I finally loaded it up to Youtube so we coudl share. It’s rather low fidelity for some reason – not sure why…anyways, after all the pretty mountain pictures you’ll see how we told them! We went to my cousin’s wedding last weekend in PA and it was there first time in a while that all of us had been together in one spot for more than an hour or so and we took full advantage. I assure you I’ve not been drinking in this pics, we were just having such an amazing time with one another it was hard not to get goofy and have a blast. And I’ve proved that pregnancy is not a disablity – I spent most of my evening grooving on the dance floor with my dad, Caty, and/or my bro, husband, grandma, aunts, uncles and the rest. It was serioulsy a blast! I’ve been taking videos here and there of the reno but these are probably the most fun. We borrowed my dad’s Sawz-all to help take down the pantry and it’s come in very handy all over. I didn’t get pantry demo pics because I was at Home Depot while DH proceeded without me (no need to be there in all that dust and noise) but I did get him demoing the peninsula and taking out the parts of the counter top that we didn’t need…. Seems the list keeps getting longer but only a few of those are requirements to get our functional kitchen back. The rest is finish work. The main targets this week are to finish the tiling which means the rest of the bases have to come out. Then next week is cabinet building with DH’s parents. The following weekend is cabinet hanging with my parents and then we should be back to semi functional. A quick plywood top will hold us over until the granite is picked, ordered, and delivered. Now, to start saving for that task! Here’s where are as of yesterday…. The peninsula is gone too but only temporarily….we’ll put it back with another corner cabinet, and two sets of drawers instead of one big cabinet. Much easier to organize that way! Yes, the uppers will come down too…it’s just not necessary at this point and I was tired after all that…. Below is DH taking out the cabinets under the counter top. We had to cut the top because we wanted to preserve the area around the sink for now…we’re trying to do this reno while minimizing the impact as much as possible to the function of the kitchen. It’s probably making it harder in the long run but having a sink with running water, a stove, and a fridge is just too convenient. And last but not least, the work we did this past week. We got the new pantry and upper cabinet up. We moved the fridge back only to find out that we needed to add a little more space – the opening is exactly the same size as the fridge which prevents us from opening the door past 90 degrees…oh well…it’s functional for now, we’ll fix it later:) But until then, we can’t load the cabinet..bummer. We also discovered that we’re missing a bunch of stuff from our shipment. Namely the cover panels for the side of that cabinet, the plinth for the floor that covers the bottom of the cabinet and a few other cover panels. There is an Ikea trip in our future for sure! Stretch marks? Nope…c’mon genetics, don’t fail me now! Baby Movement? I felt him the other night with my hand but he stopped moving when DH put his hand down – of course! Best moment this week? Feeling him kick on the outside and getting our first boy baby clothes from my mom! Milestones? Finding out that the little kicker is a boy:) Also, seeing my parents for the first time since we told them 10 weeks ago! I can’t believe it was that long ago! Okay, maybe just kicks! Over the past few days our little boys kicks have been getting stronger and more frequent – he’s well on his way to being an all-star soccer player or football place kicker! As luck would have it, he seems to be using my bladder as target practice – thanks buddy! 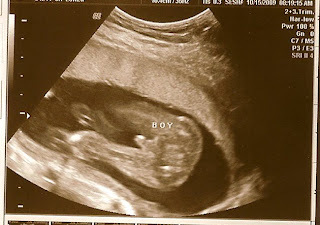 I can’t believe we’re having a little boy! Now we just have to come up with some names for him! This pic is the other one they gave us (we have video that Mark shot too that i’ll have to loop together and post). You can see his head and eye sockets, brain etc on the right of the image. The funny thing in the middle is his umbilical cord which has the right number of vessels in it and everything! How far along are you? Half way baby! 20 Weeks! Total Weight gain/loss? +10lb based on yesterdays dr appt – yikes! Stretch marks? Nothing new, been trying to get better about buttering up…. Best moment this week? Scoring a Kelty Wallaby baby carrier for $30 on babysteals.com! Food Cravings? Still fruit juices with a side of Marshmallow fluff thank’s to Good Eats on TV! Belly button in or out? Getting shallower most definitley – i can stretch it and see it start to pop…i wonder what’s going to happen when my belly gets that big..
Milestones? 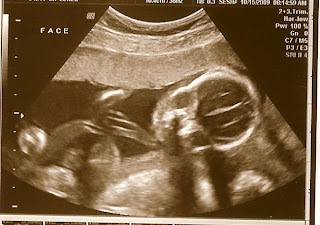 Our big ultrasound is Thursday – hoping the baby is cooperative and shows us the goods! I have a nursery to plan! Progress! We managed to get the rest of the majority of field tiles laid and have tiled in the fridge area. Now I just need to grout what we have down, seal the fridge area and hang the cabinets around it then replace the fridge! As you can see, lots of work still but we’re making progress – slowly but surely! At some point we’ll need to take a break and work on the nursery for the baby but I’m hoping that maybe my brother and I can handle that while Mark works on the kitchen – who knows. Best and worst part of home renovations without a contractor – you’re at your own mercy! 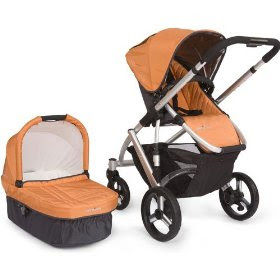 The Uppababy Vista 2009 in Orange (Alex). 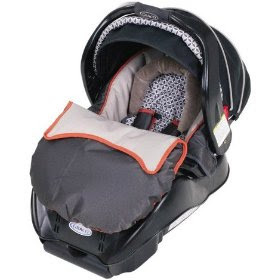 I love that it has so many positions for the baby, a bracket attachment for the Graco infant carrier, a bassinet that attaches, adjustable handles, shock absorbing wheels..i could go on and on…not to mention it’s totally cute! But, the $700 odd dollar price tag is a shocker and way way way beyond our budget! 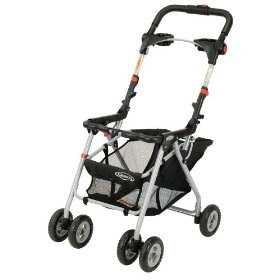 Both are safe and I’d still have to get the infant carrier for car rides etc…but the Uppababy is just so darn cute! Oh well, I’ll just have to admire the picture – the baby won’t notice the difference any who. Does anyone else see it? I think I’ve popped…maybe. It could be the pants or the different shirt but top pic is 19w even and bottom pic is today, 19w3d…..
Or maybe it’s the bowl of mac and cheeze I just ate. In any case, things are growing!! I like to think of myself as eco conscious or eco friendly. I’m not overly committed to all things green (and should be more) but am conscious of my actions and what they do to contribute to or repair environmental damage. We’ve tried to implement what we can around the house with energy efficient bulbs, lighting timers, recycling, buying local or growing your own produce, etc and are cognizant of the trades offs of not recycling vs. letting that truck drive 100 miles to the nearest center…..however, with the impending birth of our child it opens a whole new set of things to think about – the biggest of which is diapers! It really bothers me to know that 1 disposable diaper can last up to 500 years in a land fill and that over 50 million diapers enter landfills everyday! However, I’m not sure I can handle full cloth diapers. I plan on going back to work not long after our little one is born and not many places around here will deal with cloth. So I set out in search of more information and options – thank you Mr. Google! While looking up more info on cloth diapers I came across a hybrid of sorts called gDiapers and I think I’m in love! They’re the best of both worlds! They have the cloth/waterproof outer cover but have a disposable/biodegradable liner that gets flushed in your toilet just like TP, tossed on your compost pile to add to nitrogen rich fertilizer or can be tossed on the trash! They bio degrade in 50-150 days vs the 500 years of a fully disposable diper. How can you go wrong with this? You dont spend the extra water and soap to wash them (you wash the liners like you do the rest of LO’s clothes) and they can contribute to next years tomato crop (okay, that sounds a little gross). It’s a simple as recycling your newspaper according to the website. AND – i’m happy to report – Target has them in the store so on the registry they go (once we actually register!) and diapers.com sells them as well so we can stock up any time we need to. We’ll likely have to use disposables while LO is a newborn as the gDiaper starts at 8lbs but that shouldn’t be for long and heck, if this child is anything like his/her father, we may start out at 8lbs (or more – ouch!) so then we’re saved! I’m sure we’ll keep a disposable or two in the house in case of emergency but it makes me feel better that we’re not contributing to increasing our landfills (or adding to the emissions when things are burned). How far along are you? 19 weeks – holy cow, almost half way! Stretch marks? Noticed a few on my thighs that weren’t there before….time to butter up! Best moment this week? Non baby related – starting the demo on the rest of the kitchen! We’re making progress! Food Cravings? OJ and Apple Juice! Not a huge difference from two weeks ago but they tell me that from here on out the growth will be more dramatic! So, the hole where the fridge belongs. The goal is to get that tiled, grouted and get the fridge back in next weekend as well as get the surrounding cabinets hung. The bucket is catching the drips from the ice maker hose that we can’t quite fully cap. Mark needs to install a valve – maybe tonight. The rest of my kitchen, notice the stove in the middle of the room. It had to be move to get the tile out from under it and to allow us to put new tile under it so it matches the countertop height! The dishwasher was a different problem that will likely have to be tackled by a pro! And lastly, my dining room table. We’re resorting to eating in the sun room on our old kitchen table (with lots of layers since it’s quite chilly in the AM now). This is only the bottom of one closet and one small cabinet. We’re in real trouble with we have to fully empty the pantry to demo it! If anyone is close and has boxes, please consider donating them to our cause:) We have to empty the rest of the closets soon and I have no idea what I’m going to do with all the cans – I’m trying hard to eat them all before we get there….time to get creative with the recipes! Then I started to notice that I didn’t have headaches the days I wasn’t staring at the computer all day or days that I got a good exercise session in and put two and two together. Combined with sitting in the same position all day and starting at a glaring screen, my head was rebelling and telling me to stop working. Funny how your body makes you do what it needs! Disclaimer: The following blog is a tired rambling of a set of thoughts I had yesterday while walking to work. I fully understand that not all homeless people can be classified as I have below. I was walking to work yesterday and came across a homeless man. This isn’t uncommon in San Jose but today it made me think more than I normally do about their situation and what they right thing to do was. The man was nice and greeted me with a warm hello as I walked by and then asked for some change for a bite to eat. I was torn – should I show unbiased compassion and give him a few bucks? or would that simply be naive or enabling him to continue his begging for surely he would have used my few bucks to buy booze or score drugs….Or was he simply in a rut and needed someone to show him a better side of the world? what would I want done if I were in that situation? Then I got to thinking, what do we teach our children about these people? What am I suppose to say to that baby in my belly about this man? To we teach them to show compassion and treat them as you would want to be treated? Or do we teach them to look away and not enable someone that should be able to fend for himself? I know not all homeless people are there because they’re alcoholics or drug addicts. Some are simply way down on their luck and need a hand up to get back onto a better track. But often times the are dangerous people driven to crime to support themselves (and whatever habit they may have). By teaching our children to be compassionate are we putting them in harms way when perchance they interact with these people? My mom is a very compassionate individual (dad too for that matter) and I know in that situation she would have bought the man breakfast or a sandwich to help ease his hunger. This was crystalized in my mind one day in LA when we were getting breakfast at McDonalds and were approached (in the car!) by a disheviled, dirty, and obviously hungry woman asking for change. Rather than giving her change, my mom bought extra food to give to her. I like to think that I’d always do the same but I find myself questioning it every time. I walked away from the man not feeding him or giving him money and felt terrible about it the whole way to the office and still do. There’s a bible verse that just kept running thru my head: “for that which you do to the lowliest, you do unto me…” and I’d failed. I’d walked right on by, ignoring his pleas for some help, too busy or concerned for my safety to help him (i was on a main street in a very public place – my safety was not at risk). I’m not sure where I’m going with this other than to try to figure out what to teach my child about this situation and how to handle it – heck, how to handle any situation that world may throw at him or her. It amazes me every day that we (Me, DH, and our siblings) turned out the way we did and I hope that I do as good a job parenting my children as our parents did us!